Are you one of those guys who bought your first Jeep just to blow off a little steam on the weekend. You bought it to allow yourself a little “alone” time busting humps in the open terrain. You bought just as a little toy that you could show off. But then suddenly those little hour-long trips to the local open lot turned into day long excursions to only places where 4x4s can reach. And oddly enough your “alone” time turned into enjoyable days with your family in tow. And then you realized that this little Jeep you bought for fun has actually turned into an awesome hobby that you can enjoy alone or with your family. But of course there is always more fun in numbers, especially if those numbers enjoy the exact same passion as you do. 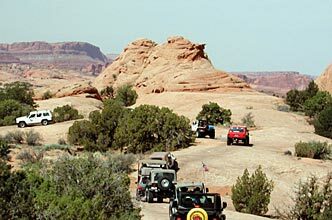 That is why we suggest you look for a local Jeep club to help expand your horizons. There are many reasons to join up with fellow Jeep lovers. The obvious reason is to get together with other people who share your same passion, but there are other benefits. One of the best , especially for newer 4×4 lovers, is the fact that most of the local Jeep clubs know exactly where the best trails are so you don’t have spend hours of driving and hundreds of dollars in gas just to find a place to do some wheeling. Another great reason to join a Jeep club is because they often become your family. One of the clubs near the Atlanta region does this great event for Halloween every year where they “dress up” their Jeeps and drive around town. In fact this year they even found a little town in North Georgia and held a Halloween Parade for the locals. By all accounts it was a blast. Of course most of us aren’t looking to hold a parade, but the point is that Jeep clubs are awesome for people who love Jeeps. They are a great way to do fun things and meet some really great people who all share one thing in common JEEPS!